Motivating the Unmotivated Child - Something New Everyday! Getting into the back-to-school routine can be hard for everyone in the house. In the morning, parents are faced with groggy kids who won't get out of bed and get ready for school no matter how much you nag, bribe and scold. 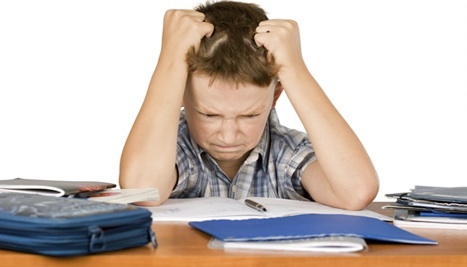 Homework time can be even worse, with nightly fights and accusations echoing off the walls of your home. So how can you get your child to be more motivated? The important thing to remember is this: your child is motivated—they're just motivated to resist you. Keep reading to find out how you can turn this negative motivation into a positive one. Q: When a child becomes unmotivated and won't get out of bed, do homework or participate in activities, what is he trying to tell the parent through this behavior? When we're talking about kids not getting out of bed, not doing their homework or school assignments or not wanting to get involved in family activities, it's important for parents to realize that there is motivation in the child. But the motivation is to resist. The motivation is to do things their way, not yours, and to retain power. When people feel powerless, they try to feel powerful by withholding. A child or teenager who feels very powerless will stay in bed, not go to school, avoid homework, sit on the couch and withhold overall involvement because it gives them a sense of being in control. To the parent, the behavior looks completely out of control. But the child sees it as the only way to have power over what's going on around him. "You have to have the courage to let him experience the natural consequences of his behavior." The child who uses resistance to control lacks both social skills and problem solving skills. It's important to define the difference between the two. Social skills are how to talk to other people, how to be friendly, how to feel comfortable inside your own skin and how to deal with people's kindness. Problem solving skills are the skills that help kids figure out what people want from them, how to give it, how to deal with other people's behavior, expectations and demands. Problem solving skills are needed to help a child handle being criticized in class. Many times the real reason kids don't want to do their homework is because they're simply lazy about the work or they don't want to be criticized in class and held accountable for their work. I want to be clear about this point: everyone is motivated. The question is, motivated to do what? If a child looks like he's not motivated, you have to look at what he's accomplishing and assume that this is what he's motivated to do. So part of the solution is getting him to be motivated to do something else. To assume that the child is unmotivated is an ineffective way of looking at it. He is motivated. He's simply motivated to do nothing. In this case, doing nothing means resisting and holding back to exercise control over you. You'll see it when you ask your child a question and he doesn't answer, but you know he heard you. What's that all about? That's a child withholding an answer to feel powerful. When he says, "I don't have to answer you if I don't want to," you see it as a lack of motivation. He sees it as a way to win control over you. Q: As parents, we tend to respond to this unmotivated behavior by coaxing, arguing and screaming at the child. Or you just give up and do the child's tasks for him because you don't see another way. It doesn't work, but it's all you can do, it seems. Very often these kids are motivated by a power struggle. They find different ways to have that struggle with their parents. The job of the parents in this case is to find other ways for the child to solve the problem that's inherent in the power struggle. But if parents don't have those other ways, then they just get locked into the power struggle. If you're fighting day after day with a kid who won't get out of bed, you're never going to solve that problem. Because even if he gets out of bed, then he won't brush his teeth. And even if he brushes his teeth he won't comb his hair. Or he won't wear clean clothes or he won't do his homework. If continually resisting is how a child tries to solve the problem of authority, then parents will have a hard time until they teach the child how to solve that problem appropriately. The first step in teaching kids the problem solving skills they need is to understand how they think and realize that these kids are not helpless victims. They're simply trying to solve problems, but the way they're solving them is ineffective, inefficient and distorted. You have to deal with this distorted attempt for control in a systemic way. To give a simplistic solution like taking away his phone or taking away his TV does not deal with the problem. It won't work. You have to look at the whole comprehensive picture. Q: So how can parents deal with this behavior more effectively, without screaming, arguing or "overdoing" for the child? I think parents should avoid giving the behavior power. When you yell at your child for lack of motivation, you're giving the resisting behavior power. I understand that parents get frustrated and yell. The point I want to make here is that it won't solve the problem. If you're yelling or arguing with this child over these issues, you're giving him more power in the struggle, and you don't want to do that. Leave the choices really clear for the child. Use "I" words. "I want you to get up out of bed and get ready for school." "I want you to do your homework now." Then leave the bedroom. If the kid doesn't do it, then there should be consequences. There should be accountability. If the kid says, "I don't care about the consequences," ignore it. Telling you he doesn't care gives him a sense of being in control and a sense of power. I would give consequences, and I don't care if the kid doesn't like it. If you don't get out of bed, you shouldn't be doing anything else. You shouldn't get to play video games. You shouldn't spend four hours in front of the TV. If you're too sick to go to school, you shouldn't be going out of the house. Those limits should be set and followed through. I would always tell parents in my office that you have to have the courage to let him experience the natural consequences of his behavior. It takes a lot of courage to step back and say, "Okay, you're not going to do your homework, and you're going to get the grades that reflect that." But in these cases, it can help to let the child experience the natural consequences of resistance. You don't let the kid watch TV. You say, "Homework time is from six to eight. And if you don't want do your homework in that time, that's fine. But you can't go on the computer, you can't play games and you can't watch TV. If you choose in that time period not to do your homework, that'll be your choice. And if you fail, that'll be your choice." Along with the plan to let him experience the natural consequences of his decision, build in rewards for success, if he does make the right decision. If my son failed a test, there was no punishment. But if he passed, there was a reward. It was very simple. We rewarded A's and B's. We didn't take anything away for C; we just didn't reward it. So my son strived to have A's all the time. So with kids who resist, it's important to have a rewards system as well as a consequence system. Remember, natural consequences are an important part of life. That's why we have speeding tickets. A speeding ticket is a natural consequence. If you go too fast, the policeman stops you and gives you a ticket. He doesn't follow you home to make sure you don't speed anymore. He lets you go. It's your job to stop and take responsibility. If you don't, you're going to get another ticket fifteen minutes later. Natural consequences help people take responsibility, and they can be used to help kids take responsibility for things like going to school, participating in class and doing homework. So when you're interacting with a kid who appears unmotivated, remember that screaming, bargaining and doing things for him will not work. When you're looking at this child, you have to remember, he is motivated. He's just motivated to do something different than what you want him to do. He's motivated to resist you. So the more power you put into it, the stronger his resistance gets. We don't argue with kids because when we argue with them, we give them power. Focus on making that behavior powerless and give the consequences that you can give so that there's accountability.